Walking is a great way for people of all ages and fitness levels to stay in shape and get active. Walking is low impact, so it is gentle on your joints especially the knees! Many people enjoy walking for it leisurely and fitness focused benefits. If you like walking for exercise, however, you want to make the most of each and every step! Many people wonder if there is a certain time of day that best promotes weight loss. Here is some information about the benefits of walking during the day vs. walking during the evening. Many people believe that walking in the morning is better for weight loss than walking in the evening. This is more about convenient however than it is about science such as calories burned or weight lost. In the morning, you are more likely to stick to getting up to exercise. During this time, you do not have anything else that can come up and detract you from your intentions to work out. It is must easier to develop a habit of getting up early to exercise and walk than it is in the evening when distractions are ample and other plans or opportunities may arise. A study also revealed that a brisk, 45-minute walk in the morning helped to curb food cravings and resulted in people being less interested in or swayed by food advertisements. This can help you to stick to your diet plan in addition to your exercise for a well-rounded lifestyle change. 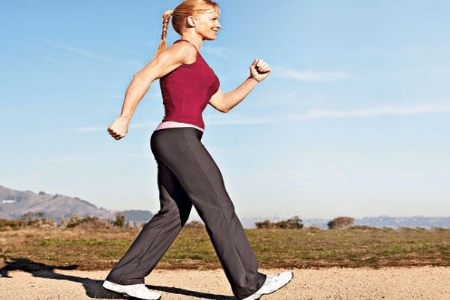 Walking in the morning is also beneficial because it can jump start your day. You will start burning calories and using energy earlier, setting your metabolism in motion for the rest of the day. You will raise your heart rate and likely burn more total calories from the time you wake up to the time you go to sleep at night. Morning walks are often more comfortable too since the air is cooler and the sun hasn’t gotten high enough to be too strong. In addition air pollution levels are much lower in the morning, which is good for your health and quality of life over time. Evening walks can be nice as well, so the difference really depends on your schedule and your preferences. If you are truly not a morning person, morning walks will likely be less effective for you as you work towards your weight loss goals since you are less likely to stick to the schedule. Your body temperature and hormones are higher in the afternoon and evening meaning that most people will get the same calorie burning effects later in the day. Also, later in the day your muscles are warmed up as opposed to cold and stiff in the morning. Warm muscles helps you prevent injuries. If you are trying to lose weight with a Medifast California weight loss plan, be sure to incorporate a form of exercise into this plan such as walking. Walking in the morning can be a great way to jumpstart your day while evening walks are often more effective and safe since your heart rate is up and your muscles are prepped. When you walk is really up to you and what works best for your schedule. Once you pick a time, stick to it to see great results and feel good too!